The game is over and the winner has been announced. In a complete shutout, Team Salsa defeated Team Guac in all 3 categories. Most popular, most clout in normal, most clout in pro. Hat trick. Sweep. That’s enough sports terms. Funnily enough, less accusations of cheating have been thrown around. Unlike last time, there aren’t any suspicious screencaps floating around. During our time with it, we both had an early on session in the day, and one later at night, where we were paired with other people from team salsa for many same-team battles. It happened too often. Something had to be up for there to be that many fights from the same team. I mean, how do they even score that? Only the winning team gives clout and the other does not? Probably. 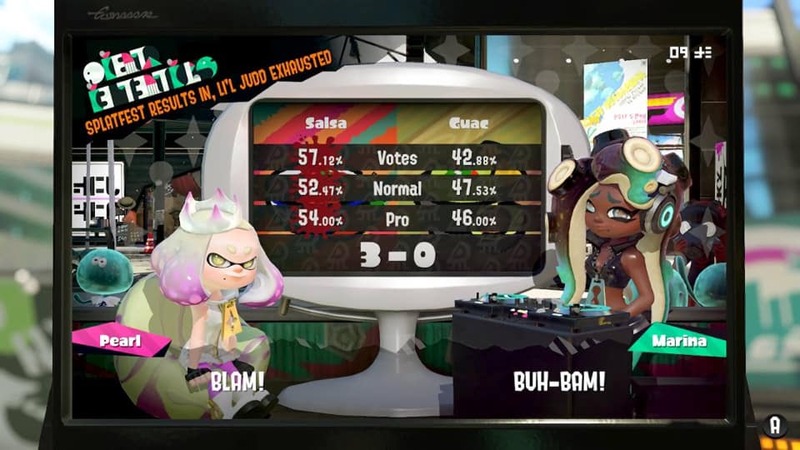 Either way, that’s the Splatfest November 2018 results for ya. Chet was able to record himself, this time in style. Going on full streamer mode, he played the game while putting up his face on camera for all to see. Also he was terrible. He did not help in anyway. Point and laugh! And also, tell us what our gameplay vids need. More comedy? More popups? More fast editing? Tell us below. Enjoy!